Meatballs sold at Sam's Club under the Member's Mark brand are being recalled because of a listeria threat. The ready-to-eat frozen beef meatball items were produced on Dec. 17, 2017, and sold in nine states, including North Carolina. New Jersey-based Rich Products Corp. issued the recall on approximately 3,420 pounds of the beef meatball products that may be adulterated with Listeria monocytogenes, the U.S. Department of Agriculture's Food Safety and Inspection Service announced Wednesday. 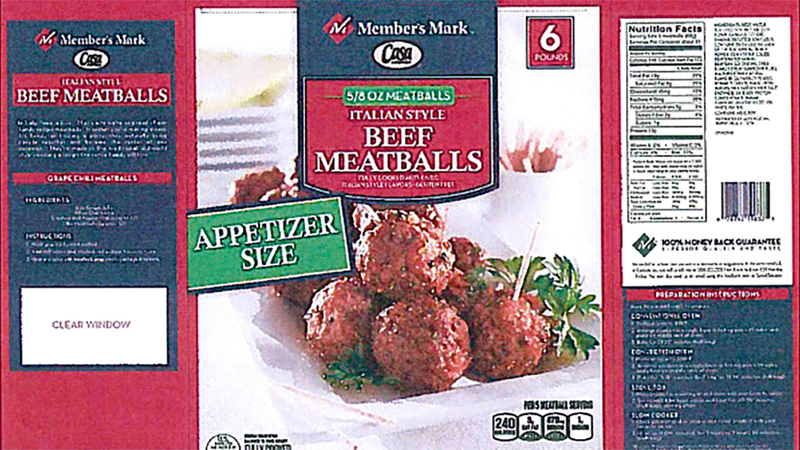 The products recalled are 36-pound cases containing six 6-pound bags of "Member's Mark Casa Di Bertacchi Italian Style Beef Meatballs with a "Best if Used By 17 DEC 2018" label and a lot code of 15507351 on the packaging. The products subject to recall bear establishment number "EST. 5336" inside the USDA mark of inspection. These items were shipped to distributers in Alabama, Florida, Louisiana, Mississippi, North Carolina, South Carolina, Tennessee, Texas, and Virginia. The problem was discovered Thursday. People in the higher-risk categories who experience flu-like symptoms within two months after eating contaminated food should seek medical care and tell the health care provider about eating the contaminated food. Consumers who have purchased these products are urged not to eat them. These products should be thrown away or returned to the place of purchase. Consumers with questions regarding the recall can contact Customer Care at Rich Products Corporation at (800) 356-7094.